It’s been a while Mark Jones started to gently pressure me to write a blog post about CometChat for SharePoint, and today I’ve eventually given in. It turns out quite a few people have wondered how we implemented the chat tool on the SP24 Conference web site, so this blog post will try to explain how we did it. First of all, for those who have no idea what I’m talking about, go check www.sp24conf.com , create an account and sign in. That may sound like a fancy functionality to implement, but it really isn’t. So here’s how you, dear reader, can also implement it on your external (or even internal) site, if you can’t rely on Lync for IM communications or plainly want in-browser, in-context chat capabilities. Let’s start with a disclaimer: I didn’t build the chat component from scratch. Hey, I’m not that crazy, I have a sheer dislike for any effort that involves reinventing the wheel and I’m a bit technically challenged (did I mention I’m a bit lazy too?). Plus, some people actually make a living building those kinds of things, so why not leverage their craft and help them by giving them a bit of hard-earned money? As a matter of fact, we (i.e. Mark Jones from Collaboris and I) decided to use CometChat (disclaimer: Mark actually pointed me to CometChat and I indeed found out it was fairly easy to integrate with SharePoint). It’s a very nifty chat software tool that sells for a very reasonable price: $49 for the basic license which we use on www.sp24conf.com . Go check it out the pricing page at https://www.cometchat.com/buy , it’s definitely worth it (and no, RioLinx is not a CometChat affiliate, I just feel they deserve some credit for an awesome tool). OK, enough with the high-fives and free advertising, let’s get to the hard part (the technical one, I mean). Though you’ll soon realize it’s not that hard. CometChat is a PHP+MySQL or PHP+MS SQL Server web application. 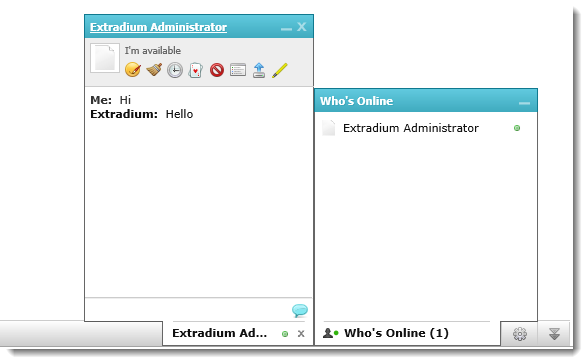 CometChat can either run inside an existing application (such as https://www.sp24conf.com/cometchat ), but it also supports what it calls “cross-domain support”. I guess the definition of “cross-domain support” is a bit loose in this case, but that basically means CometChat can run on a separate server, sub-domain or sibling domain. For instance, we can run CometChat at https://chat.sp24conf.com , which is effectively what we’ve chosen to do, if only because running a virtual web application within SharePoint wasn’t really enticing (and probably wouldn’t be supported). The rest of the discussion will thus assume that CometChat runs in cross-domain support. Generating the cc_data cookie on all pages of a site collection is achieved by leveraging SharePoint’s control delegate mechanism: both the cookie and CometChat script/css references are spit out by a custom control emitted inside the AdditionalPageHead delegate control commonly found in most SharePoint master pages. That’s it! Once again, you can see the result at www.sp24conf.com, but if you want to run CometChat for SharePoint in your own environment, the following section will help you set it up. And if for some reason, you don’t feel like doing the integration yourself, we can do it for you as a custom consulting engagement. Just contact us at https://www.riolinx.com/contactus and we’ll discuss the details. 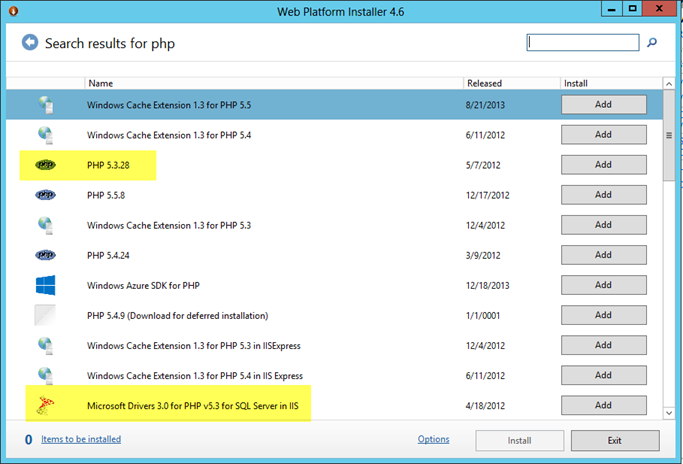 How to set it up in a SharePoint 2013 environment? Before I delve into the setup details, did I mention this integration doesn’t work with Office 365? If not, you’ve been warned now. The CHMOD message is somewhat puzzling for windows users, but basically here’s what worked for me: Right-click on each folder or file mentioned in that list, select the Security tab and add Everyone with the following permissions: Read & Write. 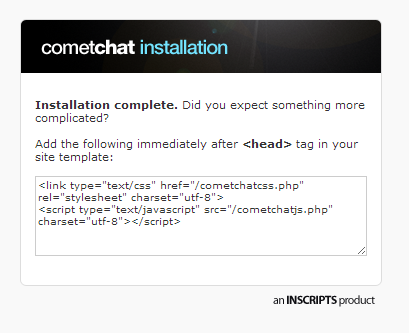 It’s a bit tedious, but you’ll get through it and eventually get the “Installation complete” message. Well… not quite. You still have quite a few things to install and configure. First of all, the CometChat database schema is missing a critical table, the Users table (that may have been fixed in the latest MS-SQL version of CometChat). To add that table, download the CometChat for SharePoint 2013 solution from https://spcometchat.codeplex.com and find the cc_users_table.sql script. 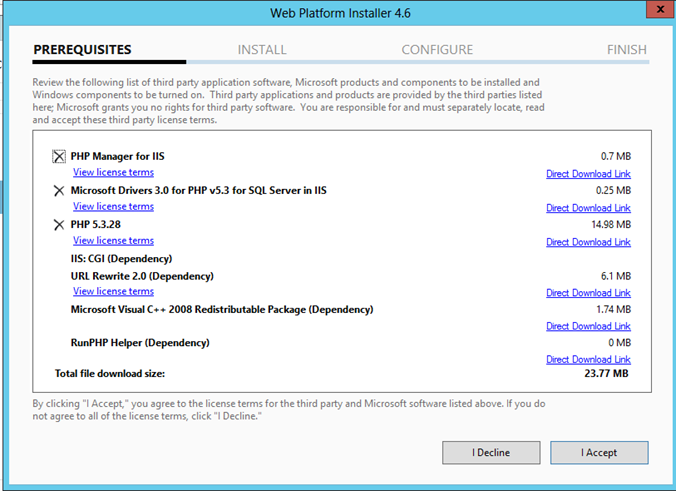 Execute it in SQL Server Management Studio and voila! You now have a cc_users table. 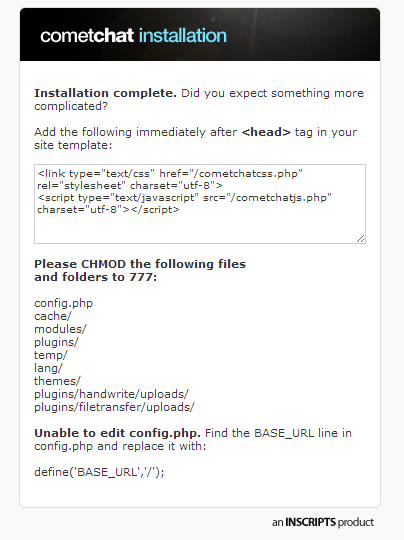 Next, open the CometChat config.php file. Set the BASE_URL parameter to the full url of your CometChat application (https://chat.company.com in my example above) and don’t forget to set the CROSS_DOMAIN parameter to 1 (as mentioned here). OK, we’re done with the CometChat part (phew!). Now let’s move over to SharePoint. Grab the SPCometChat.zip file from https://spcometchat.codeplex.com/releases/view/118364 and run SPCometChat_Install.ps1 (on your SharePoint server, of course). Next, deploy the riolinx.sharepoint.cometchat.wsp solution to your SharePoint Web Application (https://sp.company.com , in my case). Configure the cookie domain, CometChat url and cookie duration as your environment requires and press OK. Below are the settings I’ve used with my demo company.com domain. If you’ve carefully followed all the instructions above, you should get a nice chat bar at the bottom of your page and you should be able to start chatting with the users who are connected to the site. And if you’re stuck with a non-working setup, you can always contact us to request a short consulting engagement! But I sincerely hope you won’t need us and will be able to enjoy CometChat for SharePoint right away.